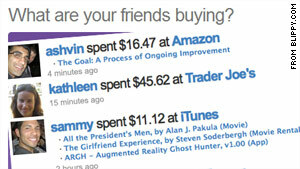 Blippy, a new site in testing, lets people share their credit card purchases online. London, England (CNN) -- Our approach to privacy evolved rapidly in 2009, as a growing array of online services propounded the benefits of digital sharing. From restaurant reviews to blog comments and Twitter updates, fewer Web users now are shy about sharing their thoughts for the world to see. But are you ready to post your credit card transactions online, too? One new company, called Blippy, hopes so. The Web is radically reshaping our views on privacy, making it almost antisocial not to share. In October, I opined that "Privacy is dead," pointing to the growing popularity of Foursquare and other services to share your location from your mobile phone. The benefits of sharing, I suggested, might begin to outweigh the risks of posting this information online. With Foursquare, they already do: Those "checking in" to certain venues receive special offers from local businesses. Other services are pushing the privacy envelope. This month, Facebook attempted make once-private posts public. Those users who idly clicked past a message about the new privacy settings have now (perhaps unwittingly) made much of their profile information public. Twitter, the micro-blogging site, had trained its users to be public, of course, by making its posts public by default from the start. But how much might we be prepared to share? Next year sees the consumer launch of the SenseCam, a device that lets you record your entire life via a camera around your neck, snapping photos every 30 seconds. Should we be surprised if avid life-loggers begin posting this data online? Hardly. Fitbit, a high-tech pedometer that logs exercise and sleep patterns, is one of many gizmos that automatically sends your data to a Web site to be shared with friends. In many cases, sharing is effortless. Modern cameras using Eye-Fi technology post photos to the Web whenever a Wi-Fi connection is found. Which brings us to Blippy. That company, which launched in test mode this month, lets users post their credit card transactions online to be shared with friends. Blippy assumes that you have many credit cards and will share information about only one. It then logs and publishes your credit card purchases at select online stores like iTunes, StubHub and Amazon. The concept is both shocking and ingenious. Consumers might reel at the privacy implications. Listing your credit card transactions on the Internet could be embarrassing or lead to identity theft. But those at the bleeding edge of technology innovation may be less surprised: Facebook tried a similar concept in 2008 under the name Beacon. It sent information from external e-commerce Web sites to Facebook. The project caused a privacy scare and resulted in a class-action lawsuit against Facebook. A $9.5 million settlement this year closed Beacon and forced Facebook to set up a nonprofit dedicated to online privacy and security. After Beacon, however, Facebook launched a similar service entitled Facebook Connect. With a subtle change that made users opt in to sharing personal information automatically unless they changed the settings, Facebook Connect succeeded where Beacon failed. Facebook users now share all kinds of third-party data on their profile pages. Could the benefits of transaction-sharing outweigh the risks? From finding people who like similar things and getting purchase recommendations to receiving special offers from stores, it's easy to imagine why publishing this data might offer advantages. You buy your groceries at Wal-mart every week? Safeway could give you 10 percent off if you shop there instead. Building a large network of friends might result in even steeper discounts: Get 20 percent off if you have 500 Blippy contacts, perhaps, since your purchase decisions will be seen by a relatively large number of people -- in effect, advertising for the stores where you shop. For many, Blippy will be a step too far. But that's not to say it's a bad idea. Rather, it may be a groundbreaking one.